← What is Napier’s Involvement with the Craighouse Development? Why has Craighouse been sold to an Offshore Company? You might have thought this should be a simple question. But, like many other simple questions about the apparent proposed development of Craighouse campus, the answer is anything but. For some, this question is irrelevant. What difference does it make who owns the site? But for us, and for anyone who cares about the buildings and the landscape, this question is critical. It is the owners who are the real decision makers and will decide what happens to Craighouse, not their contractors or fronts-people. Any officials hoping for “contributions” to schooling or traffic, should be extra sure that they know who they are talking to – or any such promises could turn out to be nothing but thin air. Who owns Craighouse is also a crucial when considering the question: do the developers have the financial and development skills to produce a good conversion to residential use for the site? In the current financial climate, even very large property developers will struggle to fund large-scale developments. We have seen, in Edinburgh, a series of development projects where promises were made, but not kept, due to lack of funding. Ok, this gets complicated – so bear with us. What does the Craighouse Partnership Say? Craighouse Limited, a single purpose company set up to hold the site for the Craighouse Partnership. Let’s be clear. Craighouse Limited is NOT The Craighouse Partnership. But who ARE Craighouse Limited? Who owns it? Who did Napier, a publicly-funded institution, sell its publicly-funded property to? What do the Official Records Say? The answer to this question should be fairly straightforward – Look it up on Companies House, you might say. We did. The result was we found that Craighouse Limited was dissolved in 2008. This mystified us for quite some time. UK companies would normally have to be much more transparent about who they are. Then, a brain-wave led us to further investigation. Looking at the papers publicly available about Craighouse Limited from the Isle of Man Companies Registry brought up 2 pieces of information that we think are relevant. The first mysterious piece of information is that Napier University have what is called a “charge notice” over the Craighouse site. This means that if Craighouse Limited doesn’t pay to Napier University all the money owed to it, then Napier can use the Craighouse site as security. Why is Napier Owed Money? We don’t fully understand the implications of this. Why is Napier still owed money? Do Napier get paid more if a large housing scheme goes through planning? Are they acting, in effect, as property speculators? It isn’t always easy getting your money from off-shore companies. Do Napier really have the legal knowledge to be able to recover debts from a complex network of companies and trusts in the Isle of Man? The second piece of information that we found interesting is that Craighouse Limited is owned by “MOREOF Seeker Limited”, another Isle of Man registered company. MOREOF seems to be an abbreviation of Mountgrange Real Estate Opportunity Fund. MOREOF is the name of the company that is said to have bought Craighouse. But what does “Seeker” mean? As part of our investigation into who LA&P are, we found reference to something called “Project Seeker”. We wondered: what is Project Seeker? According to an article last year in Property Week, the acquisition of the Napier Craighouse campus was “part of a wider land purchase initiative being undertaken by Mountgrange, called Project Seeker“ [free registration required to read this link]. Mountgrange is said to be working with “strategic land firm LA&P“. 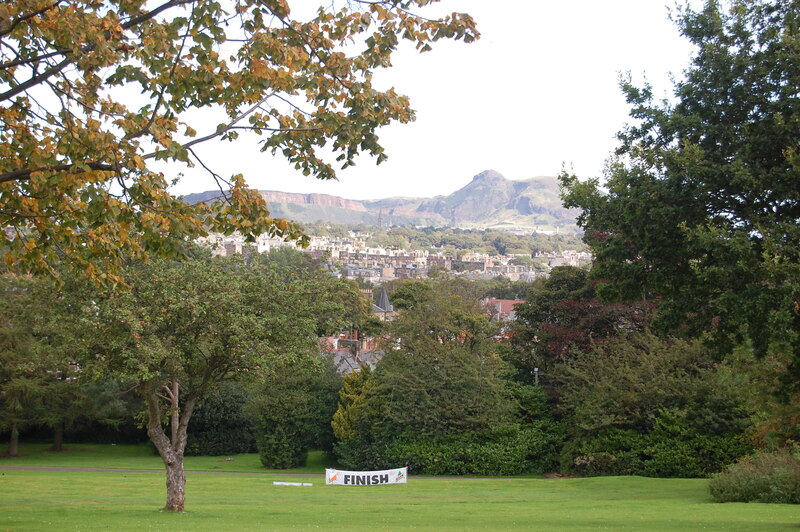 Mountgrange still use the word “Seeker” in their title for the Craighouse development project on the portfolio page on their website. And they also still describe the purchase as “Strategic Land”. The implication, to us, of calling it a strategic land project is that they are trying to speculate on the value of the land, rather than take on an actual property development project. It matters because it would be taking money from the land and making it harder for any real developer to make a profit from a reasonable development that seeks to develop the listed buildings first and foremost. It matters because any deals the council might be thinking they could make over schools and traffic or access could, when the site is passed on, be hard to enforce or useless. It matters because speculators are the last thing the site needs if it is to have a chance of creating a sustainable low-risk development. The Isle of Man Lawyers who Own Craighouse? If we look at the public documents for MOREOF Seeker Limited, we find that it appears to be owned by Cains Fiduciaries, an “Isle of Man law and professional services group”, who also seem to have set up quite a few other companies for Mountgrange. It is hard to tell if this is correct, as it is unclear to us how much of the information about ownership that UK companies have to publish has to be published by companies registered in the Isle of Man. If the site is owned by lawyers, then it is probably a trust, for the benefit of someone. But who? Napier has sold Craighouse to a consortium of mysterious offshore companies. Who finally owns Craighouse, no-one knows. Napier hasn’t even been paid the full amount for the site, but it’s going to be very hard for them to get hold of the extra cash they’re owed. This entry was posted in Consultation, LA&P, Mountgrange. Bookmark the permalink. 4 Responses to Why has Craighouse been sold to an Offshore Company? The Isle of Man is well known haven for avoidance of tax and there was a particular tax avoidance scheme promoted a year or so ago for property development companies. This might explain why Isle of Man structure is involved. Another use might be to protect from creditors chasing their debts, or to hide who the shareholders are from people like us who might object to what they are doing. 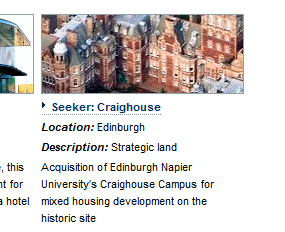 I don t think Napier ever really sold Craighouse. Tonight William Grey Muir said they retained a financial interest in MOREOF and that this was a pensions fund. The official price was £10 million and that’s too low. I really enjoyed the standard information an individual provide on your guests?